Since I love making aesthetics so much, I’ve decided to create an official weekly feature where I can post book aesthetics! They might be of a book I’m currently reading or recently read or read a long time ago or one I consider to be a favorite of mine—there’s no rhyme or reason to it! For now I just want to keep it simple and feature all different kinds of books (but there might be themes in the future). To kick off my first official Weekend Aesthetic, I’m featuring Morgan Matson’s Save the Date. I read Save the Date at the beginning of June and absolutely adored. It’s honestly one of my new all-time favorite books, so I knew I needed to share an aesthetic of this charming novel. Read my glowing 5-star review to find out more! What do you think of my new weekly feature? 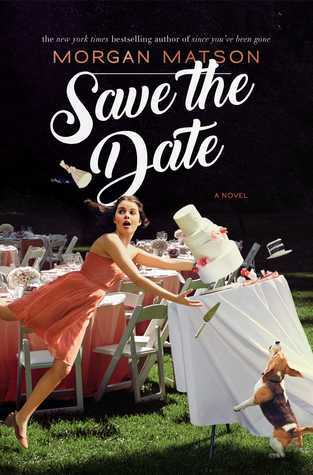 Have you read Save the Date yet? I love this new feature! You captured the essence of Save the Date perfectly with these pictures. *side note* that puppy is so cute!! Thanks, Lauren! I absolutely love how it all came together. And isn’t!? I just want to hug and play with it! Thank you, Jenn! This is one of my favorite aesthetics I’ve ever made! I just needed to make one after the book hangover I was left with upon finishing Save the Date! This is is perfect! I want the dress AND the puppy! And the street sign: LOL! Absolutely one of the best scenes in the whole book.